Pointers are excellent hunting dogs. The main reason for this is their almost endless supply of energy. If you are big into bird hunting, the Pointer would be your top choice to take with you. They can run around in circles and seemingly never get tired or worn out. If your Pointer isn’t able to release its energy by doing something constructive, then it actually could end up becoming frustrated and disruptive. This dog’s DNA was essentially designed to hunt birds and if that is not what it is doing, then it is looking for a way to do it. With that said, if you try to get your dog to play games, it may be easily distracted by something as simple as a bird flying by. Do understand that if a Pointer is on the hunt for a bird, it is very difficult to break its focus. A Pointer needs tons of exercise so if you live a sedentary life, this may not be the dog for you. It is important that this breed receive at least an hour of intense physical exertion every day to ensure that it is keeping its lean, muscular body as healthy as possible. This is certainly not a breed that should be subjected to the indoors all day. They are great for people who work-from-home or who have huge fenced in backyards with a doggy door entrance so the dog and come and go as it pleases. Pointers do best when they have another dog to play with; companionship is almost vital to their development. Pointers also need to be interactive with their owners to keep them feeling involved. Chronic Hip Dysplasia (CHD) is a concern of this breed and you should definitely take your Pointer to the vet if you notice any of the following symptoms: limping, short-sided steps in their rear legs, problems climbing or descending staircases, or tends to lag after heavy exercise. Hypothyroidism is another concern that effects many Pointers if not taken care of properly so ensure that your Pointer is exercised regularly. As they age, they also become susceptible to cataracts and deafness more so than other breeds. It is important to get your Pointer checked out if they show any signs of eyesight problems or if you begin to think they are not listening like they used to; it is very possible that they are either forming cataracts or have hearing issues. In the 17th century, Pointers were initially recorded as the breed that was used to chase rabbits. When wing-shooting popularity began to rise, people discovered that Pointers were actually a phenomenal breed for hunting birds. If a Pointer saw a bird, it would initially pause in its tracks, point to the location of the bird, which is where the name “Pointer” came from, and then wait for the fellow hunter to aim and shoot the bird. After the Spanish Succession, the British Army officers returned to their homes with this new breed. At the time they were heavy-boned, but were later crossed with Italian Pointers. This gave the Pointer the more modern look that they display today. 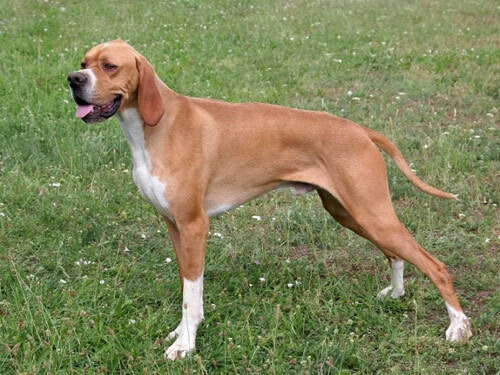 Although they fall in the category of amazing hunting dogs with Greyhounds, Foxhounds, and Bloodhounds, they are not as popular for hunting as the other three aforementioned breeds.